Somewhere between drone and ambient, with a healthy side order of post-rock influence, there Chicago trio Locrian reside. They've been a cult name for a while, coming to prominence with 2011's The Clearing, but I've been slow to hop aboard the hype train, to my regret, as Infinite Dissolution is the sort of album that demands it. It doesn't belong to any of the genres above so much as stride above them, moving swiftly and easily between them as instruments join or leave – opener Arc of Extinction begins as buzzing ambience, turning industrial and droning with the addition of percussion and then towards something blackened as distant howled vocals begin a disturbing shriek and the guitars finally override the fuzz. 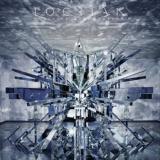 The one aspect in which I'm hesitant to praise Locrian here is that as an album, Infinite Dissolution doesn't really work well as a whole, as the tracks are too disparate and don't fit together well. Take Dark Shales, the second track on the album and one very different to the blackened buzz that came before – much more ambient and post-metal, it could almost be from a film score were it not so complicated and layered. The disturbing atmosphere of the initial track is gone entirely, and this is almost relaxed, the tribal drumming and wistful melodies putting it in the Neur-Isis camp. This is one of those rare albums that is genuinely better if you're listening to it as background music than truly focusing, as the nitpicking slides away and the impact of moments like the way the drums jolt you out of an ambient reverie at the start of KXL I is somehow greater. Taken individually, however, the pieces here are terrific if you're a fan of the style. Although I think the black metal elements present are minimalist at best and at worst overhyped, there's no denying their power when they are used. And even when they're absent, the standard is good enough that you don't really miss them. Certain tracks here are closer to rock structures than others, but both are good; an example of the more structured is The Future of Death, shimmering synths, beating drums and bellowed vocals atop a post-rock fuzz. The following An Index of Air is more ethereal to begin with, turning harsher towards the end with blackened elements and even female vocals, but this is followed by KXL II's reversion to ambience. The Great Dying and Heavy Water are more like film score extracts than anything else, vaguely Lisa Gerrard-esque wailing on the former and fuzzy synth a la some 80s soundtrack on the latter. All may have more or less of an effect on you, obviously, and it's this in part that makes reviewing albums with so avant-garde an air around them difficult. That artwork is inspired, however, and the experience of listening to Infinite Dissolution is close to that effect, the feeling of being caught between dimensions as they form and dissolve. A more unified album would have pleased me more but Locrian have more than caught my ear with this, and fans of leftfield sounds will enjoy it.